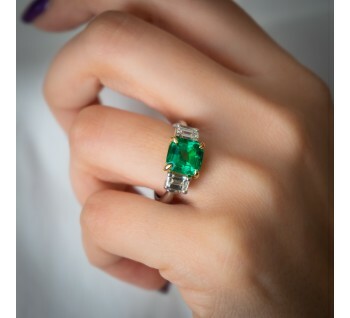 Colombian emerald and diamond ring. 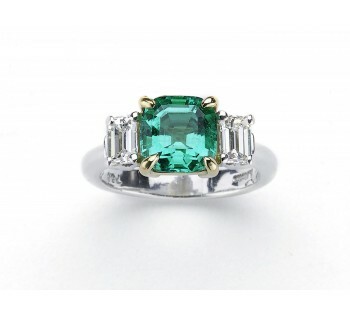 Set with a 2.40 carat octagonal step-cut emerald flanked by a emerald-cut diamond to each shoulder. Mounted in platinum slightly tapered shank. 18ct yellow gold setting for the emerald. No Oil Emeralds are very rare and extremely valuable. The majority of emeralds have oil treatment. 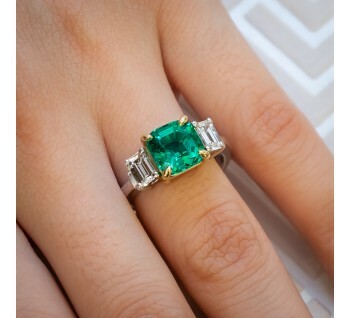 Emeralds that have no been enhanced by oil are naturally clean and have none or very little fractures inside.